Download "TUITION FEES POLICY. 1. Purpose... 2 1 Background... 2. 2. Scope... 2 2 Principles... 2"
2 1. Purpose 1 Background 1.1 The University of Bedfordshire ( the University ) is set up constitutionally as a charitable body. It operates sustainably as a not-for profit organisation. It reviews and publishes its fees annually (including Tuition Fees, referred to as Fees ) and charges (referred to as Charges ). 1.2 The University has a mission and set of values which recognise that students have a variety of personal and financial circumstances. The University sets and collects Fees and Charges with this in mind. They are a significant and vital contribution to the cost of running the University. They enable the University to provide staff and facilities to help students to succeed. 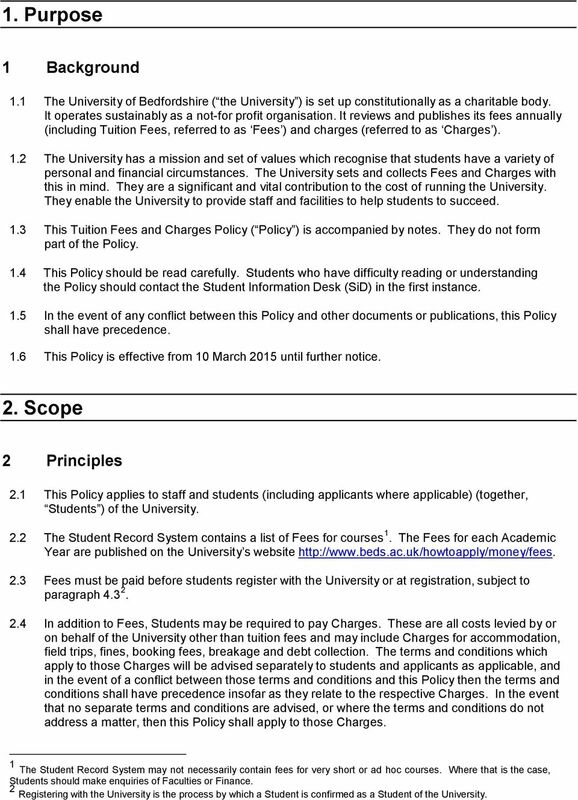 1.3 This Tuition Fees and Charges Policy ( Policy ) is accompanied by notes. They do not form part of the Policy. 1.4 This Policy should be read carefully. Students who have difficulty reading or understanding the Policy should contact the Student Information Desk (SiD) in the first instance. 1.5 In the event of any conflict between this Policy and other documents or publications, this Policy shall have precedence. 1.6 This Policy is effective from 10 March 2015 until further notice. 2. Scope 2 Principles 2.1 This Policy applies to staff and students (including applicants where applicable) (together, Students ) of the University. 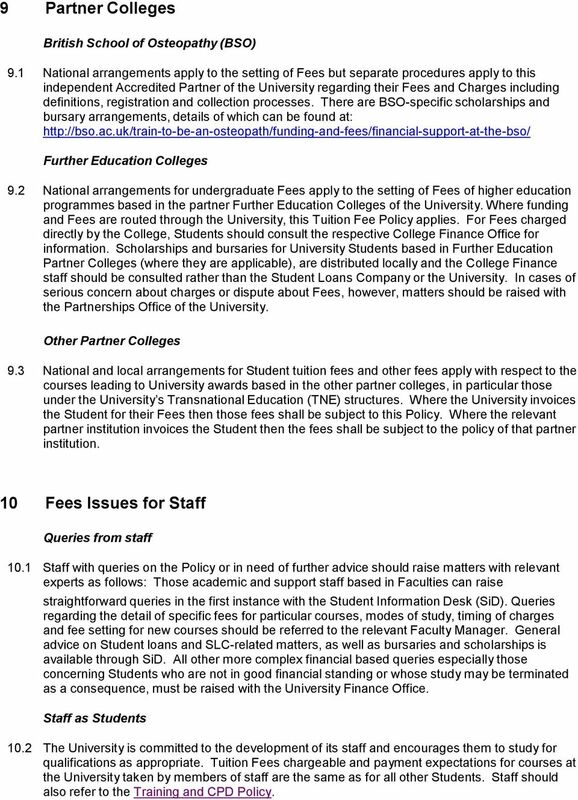 2.2 The Student Record System contains a list of Fees for courses 1. The Fees for each Academic Year are published on the University s website Fees must be paid before students register with the University or at registration, subject to paragraph In addition to Fees, Students may be required to pay Charges. These are all costs levied by or on behalf of the University other than tuition fees and may include Charges for accommodation, field trips, fines, booking fees, breakage and debt collection. The terms and conditions which apply to those Charges will be advised separately to students and applicants as applicable, and in the event of a conflict between those terms and conditions and this Policy then the terms and conditions shall have precedence insofar as they relate to the respective Charges. In the event that no separate terms and conditions are advised, or where the terms and conditions do not address a matter, then this Policy shall apply to those Charges. 1 The Student Record System may not necessarily contain fees for very short or ad hoc courses. Where that is the case, Students should make enquiries of Faculties or Finance. 2 Registering with the University is the process by which a Student is confirmed as a Student of the University. 3 2.5 Students must be in good financial standing with the University throughout their period of study. Good financial standing means not owing the University money other than with the written consent of the University. 2.6 Students who are not in good financial standing may be subject to action by the University, including withholding of University services, possible termination of registration, being prevented from using University resources and being stopped from entering University buildings. Students whose studies are terminated are not permitted to finish their course, receive award certification or attend their graduation ceremony unless the debt is cleared in full and in a timely fashion. The debt they owe to the University remains outstanding irrespective of their Student status until cleared by the Student. 3. 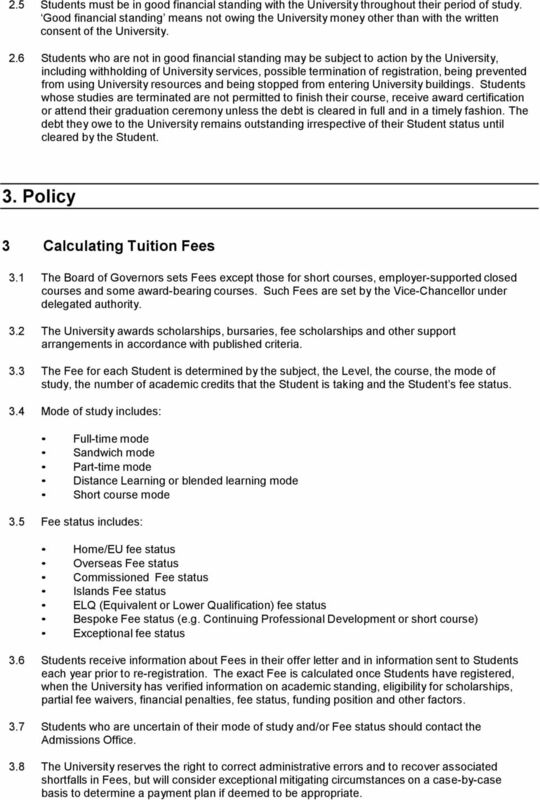 Policy 3 Calculating Tuition Fees 3.1 The Board of Governors sets Fees except those for short courses, employer-supported closed courses and some award-bearing courses. Such Fees are set by the Vice-Chancellor under delegated authority. 3.2 The University awards scholarships, bursaries, fee scholarships and other support arrangements in accordance with published criteria. 3.3 The Fee for each Student is determined by the subject, the Level, the course, the mode of study, the number of academic credits that the Student is taking and the Student s fee status. 3.4 Mode of study includes: Full-time mode Sandwich mode Part-time mode Distance Learning or blended learning mode Short course mode 3.5 Fee status includes: Home/EU fee status Overseas Fee status Commissioned Fee status Islands Fee status ELQ (Equivalent or Lower Qualification) fee status Bespoke Fee status (e.g. Continuing Professional Development or short course) Exceptional fee status 3.6 Students receive information about Fees in their offer letter and in information sent to Students each year prior to re-registration. The exact Fee is calculated once Students have registered, when the University has verified information on academic standing, eligibility for scholarships, partial fee waivers, financial penalties, fee status, funding position and other factors. 3.7 Students who are uncertain of their mode of study and/or Fee status should contact the Admissions Office. 3.8 The University reserves the right to correct administrative errors and to recover associated shortfalls in Fees, but will consider exceptional mitigating circumstances on a case-by-case basis to determine a payment plan if deemed to be appropriate. 4 4 Payment of Tuition Fees and Charges 4.1 Unless otherwise agreed, International Students and those paying for themselves without sponsorship from the Student Loans Company (SLC) or sponsor guaranteed arrangements (together Self-Funded Students ) are required to pay at least 50% of the Fees before Registration, this being a Pre-Registration Deposit. 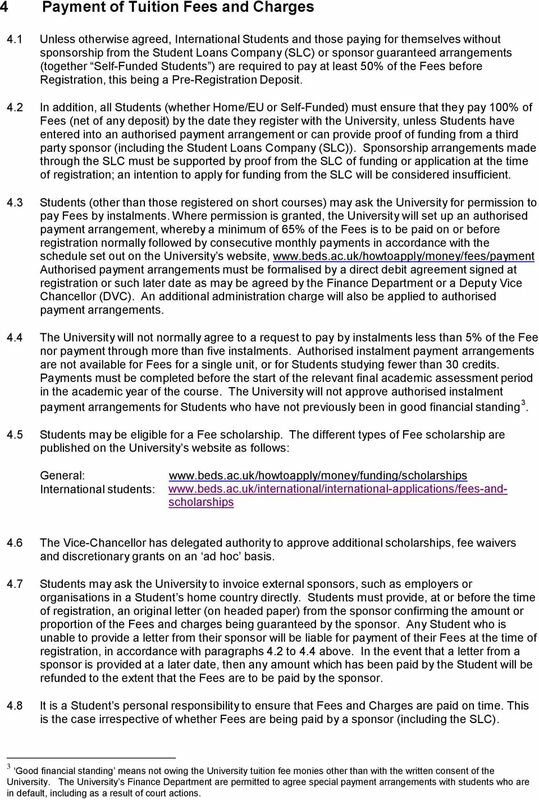 4.2 In addition, all Students (whether Home/EU or Self-Funded) must ensure that they pay 100% of Fees (net of any deposit) by the date they register with the University, unless Students have entered into an authorised payment arrangement or can provide proof of funding from a third party sponsor (including the Student Loans Company (SLC)). Sponsorship arrangements made through the SLC must be supported by proof from the SLC of funding or application at the time of registration; an intention to apply for funding from the SLC will be considered insufficient. 4.3 Students (other than those registered on short courses) may ask the University for permission to pay Fees by instalments. 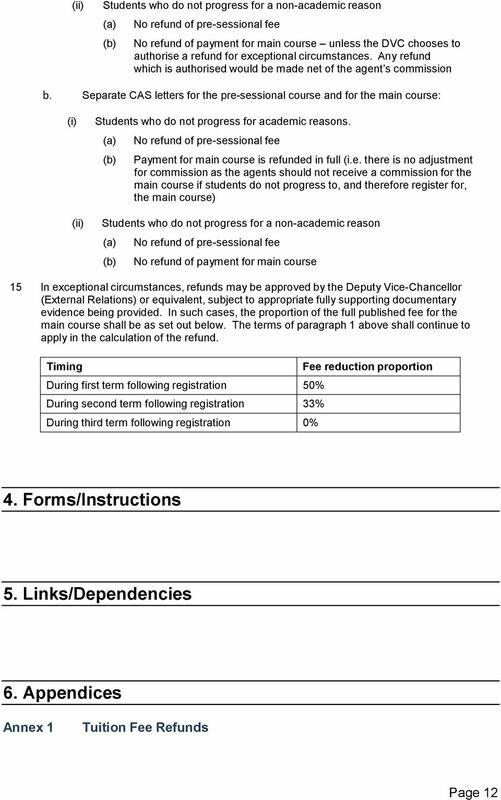 Where permission is granted, the University will set up an authorised payment arrangement, whereby a minimum of 65% of the Fees is to be paid on or before registration normally followed by consecutive monthly payments in accordance with the schedule set out on the University s website, Authorised payment arrangements must be formalised by a direct debit agreement signed at registration or such later date as may be agreed by the Finance Department or a Deputy Vice Chancellor (DVC). An additional administration charge will also be applied to authorised payment arrangements. 4.4 The University will not normally agree to a request to pay by instalments less than 5% of the Fee nor payment through more than five instalments. Authorised instalment payment arrangements are not available for Fees for a single unit, or for Students studying fewer than 30 credits. Payments must be completed before the start of the relevant final academic assessment period in the academic year of the course. The University will not approve authorised instalment payment arrangements for Students who have not previously been in good financial standing Students may be eligible for a Fee scholarship. The different types of Fee scholarship are published on the University s website as follows: General: International students: The Vice-Chancellor has delegated authority to approve additional scholarships, fee waivers and discretionary grants on an ad hoc basis. 4.7 Students may ask the University to invoice external sponsors, such as employers or organisations in a Student s home country directly. Students must provide, at or before the time of registration, an original letter (on headed paper) from the sponsor confirming the amount or proportion of the Fees and charges being guaranteed by the sponsor. Any Student who is unable to provide a letter from their sponsor will be liable for payment of their Fees at the time of registration, in accordance with paragraphs 4.2 to 4.4 above. In the event that a letter from a sponsor is provided at a later date, then any amount which has been paid by the Student will be refunded to the extent that the Fees are to be paid by the sponsor. 4.8 It is a Student s personal responsibility to ensure that Fees and Charges are paid on time. This is the case irrespective of whether Fees are being paid by a sponsor (including the SLC). 3 Good financial standing means not owing the University tuition fee monies other than with the written consent of the University. The University s Finance Department are permitted to agree special payment arrangements with students who are in default, including as a result of court actions. 5 5 Help and Advice on Payment 5.1 The Student Information Desk can provide information on fee matters and can refer students to the Student Money Advice team for detailed or complex queries. 5.2 Students who are encountering difficulty in paying an agreed Fee instalment on time should consult the Credit Services Team and seek their detailed advice and guidance. For other advice and assistance in relation to Fees, students should consult the Student Information Desk (SiD) in the first instance. 5.3 Students should refer to the University s website for information on support, including bursary and scholarship arrangements as per paragraph 4.5 above. 6 Consequences of Failing to Pay Tuition Fees and Charges Failure to pay Fees 6.1 In the event that a Student misses a payment date for Fees, the Student will be considered to be not in good financial standing, and may be subject to further action by the University, including possible termination of registration. 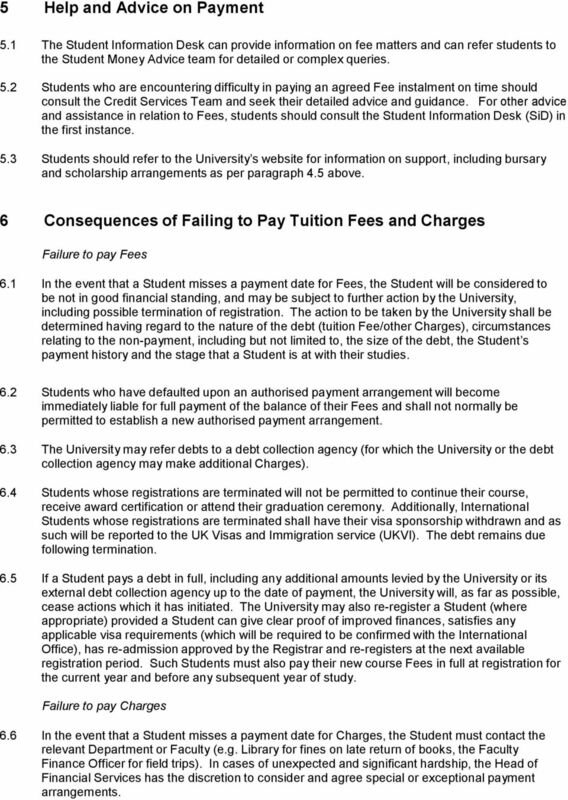 The action to be taken by the University shall be determined having regard to the nature of the debt (tuition Fee/other Charges), circumstances relating to the non-payment, including but not limited to, the size of the debt, the Student s payment history and the stage that a Student is at with their studies. 6.2 Students who have defaulted upon an authorised payment arrangement will become immediately liable for full payment of the balance of their Fees and shall not normally be permitted to establish a new authorised payment arrangement. 6.3 The University may refer debts to a debt collection agency (for which the University or the debt collection agency may make additional Charges). 6.4 Students whose registrations are terminated will not be permitted to continue their course, receive award certification or attend their graduation ceremony. Additionally, International Students whose registrations are terminated shall have their visa sponsorship withdrawn and as such will be reported to the UK Visas and Immigration service (UKVI). The debt remains due following termination. 6.5 If a Student pays a debt in full, including any additional amounts levied by the University or its external debt collection agency up to the date of payment, the University will, as far as possible, cease actions which it has initiated. The University may also re-register a Student (where appropriate) provided a Student can give clear proof of improved finances, satisfies any applicable visa requirements (which will be required to be confirmed with the International Office), has re-admission approved by the Registrar and re-registers at the next available registration period. Such Students must also pay their new course Fees in full at registration for the current year and before any subsequent year of study. Failure to pay Charges 6.6 In the event that a Student misses a payment date for Charges, the Student must contact the relevant Department or Faculty (e.g. Library for fines on late return of books, the Faculty Finance Officer for field trips). In cases of unexpected and significant hardship, the Head of Financial Services has the discretion to consider and agree special or exceptional payment arrangements. 6 Breaches of Student Code of Conduct 6.7 The University takes seriously any attempt to pay through illegal means and invokes the Student Code of Conduct ( in cases of fraud, use of counterfeit credit cards or other false payments. This may result in a Student being disciplined under the Student Code of Conduct. Such incidents (including information about the University s investigation) may also be reported to the police or other authorities. 6.8 Students must not assist other Students whose registration with the University has been terminated or who are subject to other actions pertaining to their engagement with the University to circumvent those actions. Any Student who is found to have provided such assistance will face action under the Student Code of Conduct. 7 Withdrawing, Changing Course or Mode, Repeating Study and Interruption of Study Withdrawal 7.1 Students intending to withdraw from a course must contact their Personal Academic Tutor in the Faculty and their Faculty Office or, in the case of Postgraduate Research Students (PGR), the Director of Studies and the Research Graduate School (RGS). Students with a Confirmation of Acceptance for Studies Letter (CAS) to support a Tier 4 visa application must also contact the International Office as there may be adverse consequences for a Student s right to remain in the UK for the duration of a course. 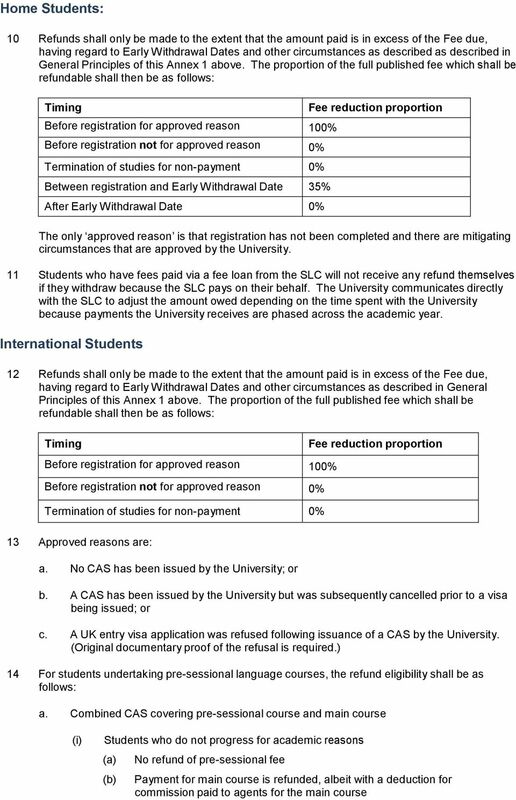 Students intending to withdraw must comply with the University withdrawal procedures ( 7.2 Students who change course and are consequently registered for a different course or who change the mode of study to take less or more time to complete the course, to move from part - time to full -time or from full- time to part time may be required to pay a different Fee. 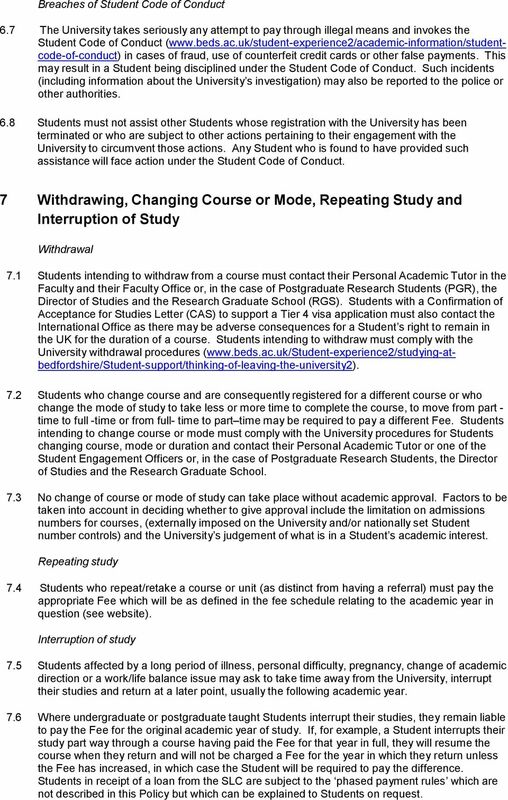 Students intending to change course or mode must comply with the University procedures for Students changing course, mode or duration and contact their Personal Academic Tutor or one of the Student Engagement Officers or, in the case of Postgraduate Research Students, the Director of Studies and the Research Graduate School. 7.3 No change of course or mode of study can take place without academic approval. Factors to be taken into account in deciding whether to give approval include the limitation on admissions numbers for courses, (externally imposed on the University and/or nationally set Student number controls) and the University s judgement of what is in a Student s academic interest. Repeating study 7.4 Students who repeat/retake a course or unit (as distinct from having a referral) must pay the appropriate Fee which will be as defined in the fee schedule relating to the academic year in question (see website). Interruption of study 7.5 Students affected by a long period of illness, personal difficulty, pregnancy, change of academic direction or a work/life balance issue may ask to take time away from the University, interrupt their studies and return at a later point, usually the following academic year. 7.6 Where undergraduate or postgraduate taught Students interrupt their studies, they remain liable to pay the Fee for the original academic year of study. If, for example, a Student interrupts their study part way through a course having paid the Fee for that year in full, they will resume the course when they return and will not be charged a Fee for the year in which they return unless the Fee has increased, in which case the Student will be required to pay the difference. Students in receipt of a loan from the SLC are subject to the phased payment rules which are not described in this Policy but which can be explained to Students on request. 7 7.7 For undergraduate or postgraduate taught Students who started their course before September 2012, the size of the difference depends on whether they are able to continue as an old regime Home or EU Student. Where an interruption is approved, the Fee for the original academic year of study remains payable; the unused money (i.e. credit balance) is rolled forward and recognised when the Student returns and registers for the next period of study after the interruption. This may result in a higher fee being incurred for the new period of study on return, depending on the length of the period of absence. Normally, no fee is charged for the approved period of absence in the next year while study is interrupted. For Students with support for their Fees from the SLC the phased payment rules apply and additional amounts are calculated on those approved dates. 7.8 Postgraduate research students who are permitted to interrupt their studies (e.g. approved suspension or maternity/adoption leave) will be liable to pay fees due up to the commencement of the interruption, will not accrue a fee liability for the period of the interruption, and will be liable to continue to pay fees from the date of their return to study. 8 Refunds 8.1 Subject to what follows in the rest of paragraph 8 and Annex 1 of the Tuition Fee Refunds schedule, the University will not refund Fees to Students who withdraw before registration. This usually only affects International Students and some Home/EU Students as they are required to pay a Pre-Registration Deposit as set out in Section 4. However, if the reason for the withdrawal is due to an unforeseeable failure to secure an entry visa to the UK, the University may refund the Deposit. The University may also decide to refund Fees paid by international Students where a Student has been refused an entry visa. 8.2 Refunds shall be made to the same source as that from which the original payment was received, having regard to the Money Laundering Regulations and related policies and guidance. In the event of any conflict, the Money Laundering Regulations and related policies and guidance as interpreted by the Finance Department shall have precedence. 8.3 If a Student withdraws from a course after registration, the Student must pay the Fee for the time they studied with the University and for the current academic year for which they registered. The decision whether to refund and the size of the refund depends on the circumstances of the withdrawal. Details are given in the Annex 1, Tuition Fee Refunds Schedule. 8.4 Any refund of Fees for a Student who is sponsored, is returned to the sponsor not to the Student, and is paid using the same payment mechanism that was used when it was originally made. 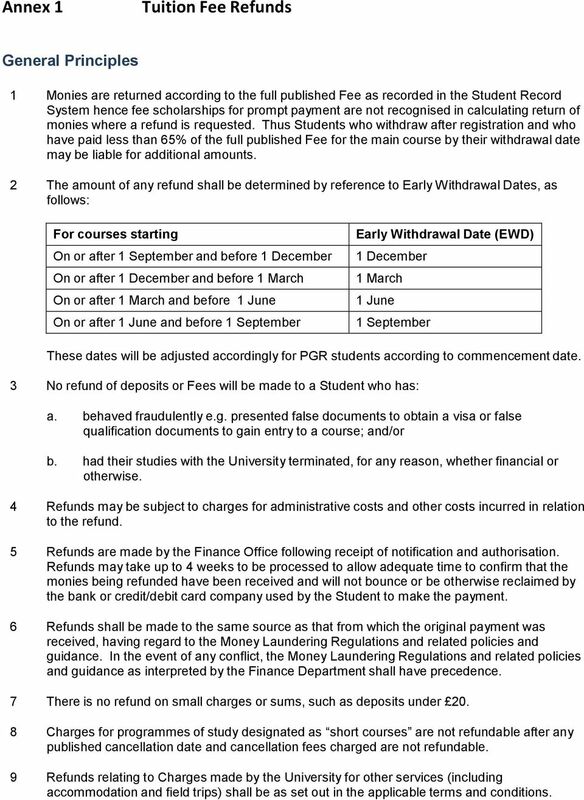 Refunds made to overseas fee status Students are returned to their country of origin, also using the same payment mechanism that was used when the payment was originally made; unless the payment was made in cash in which case a refund payment will only be made into a bank account in the Student s home country and additional evidence may be required. Payments are not returned through the University s representatives outside the UK. 8.5 Refunds relating to Charges for accommodation or associated deposits are subject to separate refund arrangements through relevant Terms and Conditions of occupancy and as advised to the student at point of contract. Cancellation fees are not refundable and normally Charges of under 20 are not refundable. Refunds for small deposits e.g. to secure a guest place at a Graduation Ceremony, are subject to separate rules on cancellation and Students are referred to the Ceremony arrangements notified to them at the time of graduation. 8.6 For Students with loans from the SLC, separate rules apply as set out in the HEI Services Guidance Note. The University will not seek to recover Fees from such Students with loans who withdraw within the terms of that Guidance Note. However, the SLC may recover monies due from the Student pursuant to the Loan and the Student should contact the SLC to establish exactly how much is owed to the SLC. 8 9 Partner Colleges British School of Osteopathy (BSO) 9.1 National arrangements apply to the setting of Fees but separate procedures apply to this independent Accredited Partner of the University regarding their Fees and Charges including definitions, registration and collection processes. There are BSO-specific scholarships and bursary arrangements, details of which can be found at: Further Education Colleges 9.2 National arrangements for undergraduate Fees apply to the setting of Fees of higher education programmes based in the partner Further Education Colleges of the University. 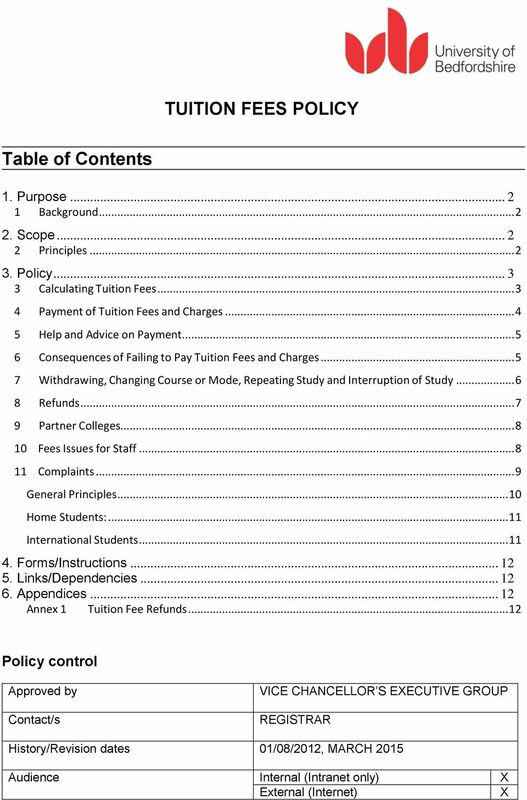 Where funding and Fees are routed through the University, this Tuition Fee Policy applies. For Fees charged directly by the College, Students should consult the respective College Finance Office for information. Scholarships and bursaries for University Students based in Further Education Partner Colleges (where they are applicable), are distributed locally and the College Finance staff should be consulted rather than the Student Loans Company or the University. In cases of serious concern about charges or dispute about Fees, however, matters should be raised with the Partnerships Office of the University. Other Partner Colleges 9.3 National and local arrangements for Student tuition fees and other fees apply with respect to the courses leading to University awards based in the other partner colleges, in particular those under the University s Transnational Education (TNE) structures. Where the University invoices the Student for their Fees then those fees shall be subject to this Policy. Where the relevant partner institution invoices the Student then the fees shall be subject to the policy of that partner institution. 10 Fees Issues for Staff Queries from staff 10.1 Staff with queries on the Policy or in need of further advice should raise matters with relevant experts as follows: Those academic and support staff based in Faculties can raise straightforward queries in the first instance with the Student Information Desk (SiD). Queries regarding the detail of specific fees for particular courses, modes of study, timing of charges and fee setting for new courses should be referred to the relevant Faculty Manager. General advice on Student loans and SLC-related matters, as well as bursaries and scholarships is available through SiD. All other more complex financial based queries especially those concerning Students who are not in good financial standing or whose study may be terminated as a consequence, must be raised with the University Finance Office. Staff as Students 10.2 The University is committed to the development of its staff and encourages them to study for qualifications as appropriate. Tuition Fees chargeable and payment expectations for courses at the University taken by members of staff are the same as for all other Students. Staff should also refer to the Training and CPD Policy. 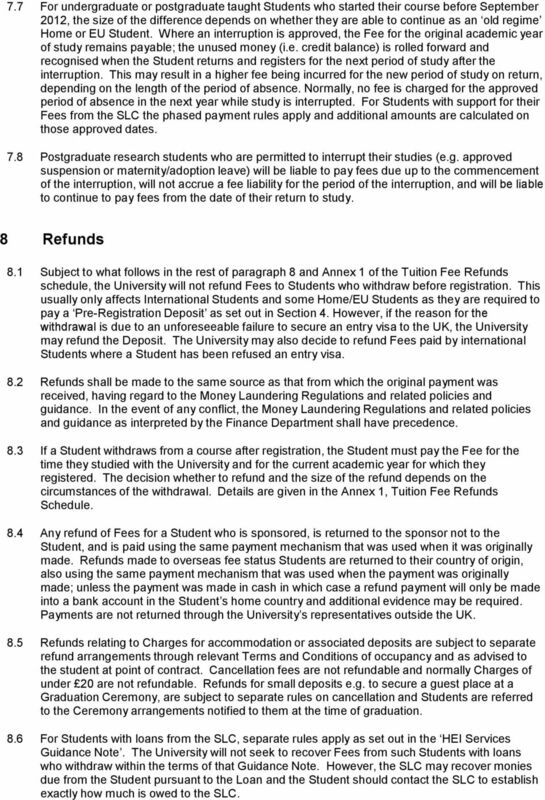 10 Annex 1 Tuition Fee Refunds General Principles 1 Monies are returned according to the full published Fee as recorded in the Student Record System hence fee scholarships for prompt payment are not recognised in calculating return of monies where a refund is requested. Thus Students who withdraw after registration and who have paid less than 65% of the full published Fee for the main course by their withdrawal date may be liable for additional amounts. 2 The amount of any refund shall be determined by reference to Early Withdrawal Dates, as follows: For courses starting On or after 1 September and before 1 December On or after 1 December and before 1 March On or after 1 March and before 1 June On or after 1 June and before 1 September Early Withdrawal Date (EWD) 1 December 1 March 1 June 1 September These dates will be adjusted accordingly for PGR students according to commencement date. 3 No refund of deposits or Fees will be made to a Student who has: a. behaved fraudulently e.g. presented false documents to obtain a visa or false qualification documents to gain entry to a course; and/or b. had their studies with the University terminated, for any reason, whether financial or otherwise. 4 Refunds may be subject to charges for administrative costs and other costs incurred in relation to the refund. 5 Refunds are made by the Finance Office following receipt of notification and authorisation. Refunds may take up to 4 weeks to be processed to allow adequate time to confirm that the monies being refunded have been received and will not bounce or be otherwise reclaimed by the bank or credit/debit card company used by the Student to make the payment. 6 Refunds shall be made to the same source as that from which the original payment was received, having regard to the Money Laundering Regulations and related policies and guidance. In the event of any conflict, the Money Laundering Regulations and related policies and guidance as interpreted by the Finance Department shall have precedence. 7 There is no refund on small charges or sums, such as deposits under Charges for programmes of study designated as short courses are not refundable after any published cancellation date and cancellation fees charged are not refundable. 9 Refunds relating to Charges made by the University for other services (including accommodation and field trips) shall be as set out in the applicable terms and conditions.